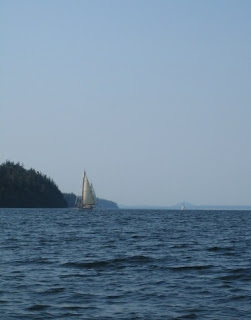 Sailing in Holmes Harbor – may as well log on to Facebook! Nameless looks like a big boat in this shot. It’s a trick of the camera. 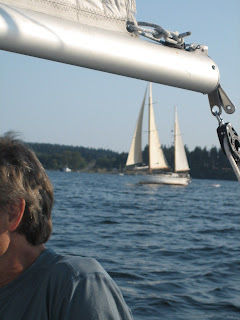 We know because when we sail up long, narrow Holmes Harbor we run into all our friends in their big boats. They sail past us with their 38 foot waterlines, their 4 or 5 feet of freeboard, their shiny steering wheels, their roller furling and their autopilots. It’s like going to Payless, our small town supermarket. Anyone who lives here learns to allow plenty of extra time when shopping, and to get the ice cream last, because you will run into many friends and have to stop to chat. Last Sunday we went out late in the afternoon. About half way up the harbor we spotted a large rig, coming toward us. It was John, heading home in September. He came about and raced us for a little while. Next came Jeff in Diva. 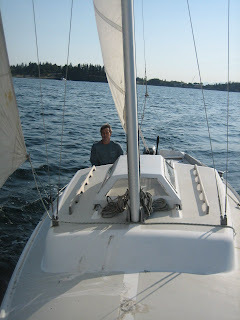 Usually he would sail a circle around us, showing off, but he was in a hurry to get back to anchor. Then came a new neighbor whose name we don’t know yet, in his sparkling, lapstrake cat boat. Luckily these experienced yachtsmen were long gone by the time we made it back, because I overshot the mooring, we had an argument about whose fault it was, had to head back out to take another pass. Luckily again, we did better the second try, ’cause it was almost dark and anchoring by moonlight is a lesson we’ve yet to study.